Azmuth is the creator of the Omnitrix and Ultimatrix and a character in the Ben 10 series. Creator of the Omnitrix and Primus. Azmuth is a Galvan, the same species as Grey Matter (who appears in Ben 10: Secret of The Omnitrix). Azmuth's scientific prowess and achievements have made him a respected scientist even to the other Galvan. Paradox has even called him the smartest being in the universe. Azmuth demures, and says he is the smartest being in three galaxies (arguably five galaxies). He is also a trusted advisor among The Plumbers. Azmuth is very pessimistic, unwilling to shut down the Omnitrix's self-destruct at first, despite it meaning the destruction of the universe (including him), simply because he didn't believe the universe to be worth saving. This is because he invented the Omnitrix so the aliens of the universe would have a better Azmuth In his suitAdded by Linkdarksideunderstanding Added by BrainInteractiveConstructof each other, but people like Vilgax only wanted to use it as a weapon of war. In Alien Force, Azmuth has become less pessimistic and more serious, showing a no-nonsense personality in War of the Worlds. Especially on the Map of Infinity dealing with a disaster of intergalactic proportions. 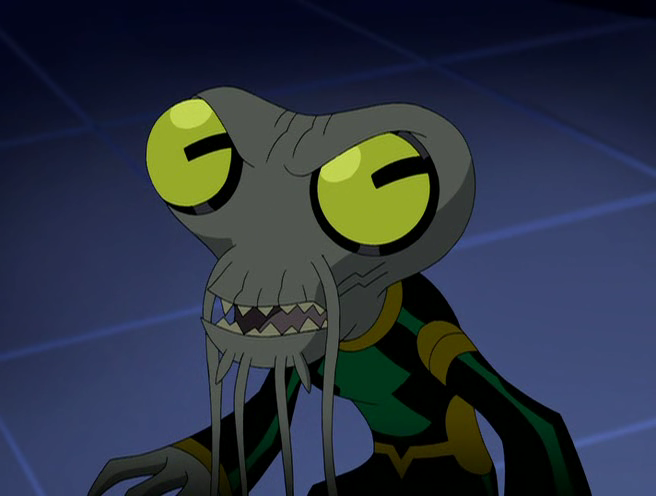 Azmuth returned in Ben 10: Alien Force in Good Copy, Bad Copy. He revealed that Albedo used to be another of his assistants and he came to retrieve the Omnitrix copy created by Albedo. Azmuth Azmuth teleportingAdded by Duncan Crookstates that their could only be one Omnitrix is allowed in the universe (though later on, Azmuth is revealed to have created a second one, the Ultimatrix, himself). Later, in the Season 2 finale War of the Worlds, Azmuth and Paradox warn Ben that the Highbreed are conquering and destroying planets and their fleet is heading towards Earth. His planet was already conquered by the Highbreed and its destruction would be the beginning of the end. Although he doesn't want Ben to fight, he realizes that there's no stopping him and activates the Master Control for the sake of the battle. When the Master Control was reset by the DNA wave Ben used to stop the High-Breed, Azmuth left to help rebuild Galvan without reactivating it, telling Ben to "have fun figuring it out". In the Season 3 premiere, The Vengeance of Vilgax, when Ben and Kevin try to hack the Omnitrix, Azmuth contacts him telling him not to tamper with it, stating that he will learn the Master Control when the time is right. When an accident unleashes Chromastone, Goop, Spidermonkey, and Way Big from the Omnitrix, Azmuth instructs Ben to reabsorb the alien forms into the Omnitrix. Dissatisfied at what happened, Azmuth also tells Ben that he won't help him again. In Primus, Azmuth briefly wields the Omnitrix in order to protect planet Primus from Vilgax, but is defeated and Vilgax takes the Omnitrix from him. Azmuth himself contributes his defeat to his "skills being a little rusty". He is saved by Ben who manages to trick Vilgax by showing him how to use the Omnitrix. Ben gets Vilgax to transform into Goop allowing Ben to get the upper hand & remove the Omnitrix from Vilgax. In the end, even though Azmuth hasn't forgiven Ben for damaging the Omnitrix, he allows him to keep it anyway. Azmuth reappears in both halves of The Final Battle. Myaxx informs him that the Ultimatrix, Azmuth's latest project, was stolen. Myaxx also shows security footage of Ben, or someone who looks exactly like him, stealing the Ultimatrix; Albedo, to which Azmuth replied "No! Not him! Anyone but him!". In the later half of the episode, Azmuth answers Ben's plead for help. He explains to Ben that the Omnitrix was originally meant for Max. When Ben says he let Azmuth down, he agrees. Azmuth tells Ben that "winning isn't so easy without the Omnitrix" making Ben realize that the only way to defeat Vilgax would be to destroy the Omnitrix. In the end, Ben gets the Ultimatrix as a replacement. Azmuth finally appears in "Ben 10 Ultimate Alien", in the episode Map of Infinity, right after Aggregor gave Ben and his team a pounding. He tells Ben and his group about the Map of Infinity (Object), an object Aggregor is planning to steal to warp to a location called the Forge of Creation. He also mocks Albedo's Ultimatrix, saying it is "nothing but trouble." He later puts Max in a tube to replace a heavily damaged nervous system caused by Aggregor. In the same episode, Azmuth reveals that he is constructing a third Omnitrix most likely his rebuilt Ultimatrix to succeed the current Ultimatrix, but is incomplete. He also refuses to let Ben have it because he is too reckless and requires much patience. He made another appearance as hologram in Perplexahedron and is not happy with Ben's failure over losing three pieces of the Map of Infinity and he told Ben where the fourth and final piece is. In The Forge of Creation, he is extremely angry of Ben's failure of losing the four pieces of the map and scolds them for having Aggregor best them each time when they have four opportunities to stop him. After Ben and Paradox transport back to Galvan Prime, Azmuth has an argument with Paradox about Ben and his friends ability to save the universe this time. He also says that trusting Ben with the Omnitrix was a "grave mistake" though Paradox had said that it was not a mistake at all, and that he, Azmuth, knew the reasons why all too well. Azmuth resentfully begins to reveal that Paradox had told him that Ben was a legendary being born with incomprehensible immeasurable power and strength, and that he would someday do something amazing one day as it was his "grand destiny", but Paradox interrupted him, saying that there must be "no spoilers." Azmuth's appearances is relatively the same as other Galvans, being roughly six inches tall, with a scrawny built, and large squarish green eyes, sharp teeth, and grey skin. He also has whiskers on each side of his face. Being a Galvan, Azmuth is super-intelligent, despite his small size. Along with his intelligence Azmuth is gifted with years of experience and knowlegde gained thanks to his age. Azmuth is a skilled inventor having created numerous inventions his greatest being the Omnitrix. He also created a high tech suit of armor (which he was seen using in his first appearence in Ben 10: Secret of The Omnitrix.) He's considered in the Ben 10 Universe as the smartest being in three (arguably five) galaxies. Because he created the Omnitrix he knows all about its functions & its secrets. In Primus, Azmuth briefly uses the Omnitrix himself to fight Vilgax. Despite being its creator, Azmuth has been shown to use the Omnitrix much less skillfully than Ben Tennyson. Azmuth attributes this to his "skills being a little rusty". Ultimatrix - The successor of the Omnitrix. Azmuth was unable to complete it but it was completed by his former assistant Albedo who completed it in The Final Battle: Part 1. He mentions that it's shoddy workmanship likely a result of Albedo not being as skilled as Azmuth. He also sites the evolutionary function as "Trouble waiting to happen". Unknown Omnitrix - In Map of infinity he said he has made yet ANOTHER new Omnitrix. He mentions that he may give it to Ben in the near future but states that neither he is ready for it and it isn't ready for him. Codon Stream - The Omnitrix/Ultimatrix DNA database. Voliticus Biopsis - They are mosquito-like creatures created by Azmuth to collect DNA from aliens for the Codon Stream. They live on Primus. Primus - A planet created by Azmuth which contains the Codon Stream. Galvan Mark II - In The Final Battle: Part 1, he is seen speaking with Myaxx about Albedo and the Ultimatrix on the newly rebuilt planet. In Map of Infinity he reveals it to be Galvan Mark II. In Map of Infinity, Azmuth mentioned another Omnitrix he was making. He said that Ben wasn't mature enough to handle it ever in his lifetime, and that he'll likely never get it unless he matures or in a serious and dire situation if the need is great but only if its complete considering the bad mistakes Ben made in the past. Azmuth's name may be a nod to Isaac Asimov, an American author and professor of biochemistry best known for his works of science fiction. Aliens, space travel, robots, and various extraterrestrial themes are featured in his stories, though it's more likely a reference to the directional term "azimuth", which means towards a direction or object. It was confirmed by Dwayne McDuffie (here) that "No, it's based on' Azimuth," an angular measurement in a three-axis coordinate system. "..... I loved Asimov when I was a kid, though." In Ben 10: Secret of the Omnitrix, the loops on his shoulders were golden. However in Alien Force, they've changed from gold to silver loops. His moustache has also grown longer. Though Azmuth is the creator of the Omnitrix and would know the most about it, he is actually not a good fighter with it. During the brief time he had it and was protecting it from Vilgax, he became Rath, one of Ben's strongest aliens, but was easily defeated. The fact that he was fighting Vilgax and that his older age and lack of battle experience most likely did not help him either. Azmuth even admits Ben has come up with ways to use the Omnitrix and its aliens in ways he would never imagine. Despite his high intellect, in War of the Worlds: Part 1, he had failed to operate a laser gun successfully; simply bouncing on the ground with it likely because of his small size and how its design and the laser gun is big for a galvan. Azmuth has changed slightly in personality between Ben 10 and Alien Force. Originally, he was more selfish and kept to himself (not even letting Myaxx see the real him, as he continually wore a robotic suit of armor he controlled from inside), willing to let the galaxy be destroyed with the Omnitrix's destruction if it meant people like Vilgax would leave him alone once and for all. He only undid the countdown and repaired the Omnitrix, releasing Way Big's DNA to help Ben, when Ben was willing to fight Vilgax despite the desperate situation. In Alien Force, Azmuth became less reclusive and more of a mentor to Ben, though it was more to warn him about messing with the Omnitrix. He would still insult Ben at times, but he was willing to leave hints for Ben to figure out about the Omnitrix. Noticeably, the change of his voice actors also gave a change to his matter of speaking. Originally, Azmuth talked more like a very intelligent know it all that would talk down to everyone. His second voice actor gave him a more elderly and wise sage matter of speaking, albeit insulting at times. Azmuth apparently knew Max back in his youth, though it was unknown if personally or by reputation. He planned to give Max the Omnitrix, considering him the only person who could be trusted with it, but it accidentally ended up in Ben's hands. It strapped itself to Ben simply because their DNA was close enough to be accepted. Though he had intended to take the Omnitrix from Ben, Max convinced him to let Ben keep it. It would appear he has a lot of respect for Max Tennyson (calling him the Greatest Plumber in the Milky Way Galaxy) and how he given so much to the galaxy. It is confirmed by Dwayne McDuffie that Azmuth did not use his DNA for Grey Matter. It is confirmed by Dwayne McDuffie that Azmuth only found Ben in the woods in The Final Battle: Part 2 because he started looking for him when the Ultimatrix core was stolen. Azmuth's voice went from being high pitched(like Grey Matter) to a normal voice. Azmuth has some resemblance to Yoda from Star Wars, One example is Azmuth motivating Ben, as Yoda motivates Jedi. Azmuth's Bio-suit in Ben 10: Secret of the Omnitrix looks a lot similar to P'andor's (NRG's) suit. Azmuth looks older in Alien Force. Azmuth expects to live another 3,000 years, stating that his race, either through natural longevity or their advanced technology. This does bring up the fact that, although Azmuth resembles an old man, we really have no idea if he is old by Galvan standards.